Mumbai: India’s benchmark stock index, the Sensex, fell in intra-day trading Wednesday to almost half its historic peak in a phenomenon that was last seen during the stock market scam of the early 1990s. It happened on a day when most global markets plunged and some rose after six major central banks, including the US Fed, cut interest rates in a lock-step fashion in an attempt to infuse liquidity and confidence in the world’s crisis-stricken finance system. 48998f2a-9559-11dd-926e-000b5dabf613.flvAdding to the fear and turmoil, the International Monetary Fund, in its bleakest forecast in years, predicted that the world economy is set for a major downturn. In linked moves, the Indian rupee recovered somewhat from a six-year low following the rate cuts by the banks, which didn’t include the Indian central bank, while oil was down in early trades on the New York Mercantile Exchange to around $89 (for November delivery). Earlier on Wednesday, the Sensex initially fell around 955 points, or 8.16%, falling to 10,700 levels, the lowest since August 2006, but eventually recovered 500 points to close at 11,328.36, still 3.14% down. Meanwhile, a key measure of volatility, also known as the “fear index" touched a high of 52.69 before it closed down at 39.30. The Nifty VIX or Volatility Index is a measure of the amount of volatility market players expect to see in the Nifty, or the National Stock Exchange 50-stock index over the next month. The Nifty itself fell 2.58% to 3,513.65. While many Asian stock markets were battered Wednesday—Tokyo lost some 9%, Hong Kong lost about 8%, Seoul slid 5.8%, and trading was suspended in Jakarta after the market slumped 10.4%—Indian and European markets first fell and then recouped some of their losses. The Bank of Japan said that it supported the move while China’s central bank slashed rates by 27 basis points. A basis point is one-hundredth of a percentage point. “This is a strong message to global markets that policy makers are taking strong supportive action," said Mark Cliffe, chief economist of ING Group from Amsterdam. “This a very welcome move considering the chaos in markets," he said, adding that it will not be the last intervention by various central banks. Indian markets will take a breather as they are closed on Thursday because of a Hindu festival. Analysts and brokers in Mumbai, however, said the interest cuts would boost investor confidence. “This is a sentiment booster," said Nilesh Shah, chief executive of domestic brokerage Ambit Capital Ltd. The impact on Indian markets when they open on Friday, will largely depend on how global markets behave on Thursday, he added. At its lowest level on Wednesday morning, Sensex was down almost 50% from its highest levels this year, which it touched on 10 January. The only time the markets saw a similar near-50% fall was in 1991-93 during the so-called Harshad Mehta scam when the late Mehta punted up stocks before the bottom fell out of the market. 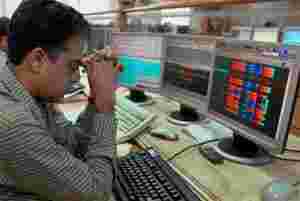 The Sensex fell from a high of 4467.32 on 22 April 1992 to a low of 2374.72 on 16 December, a fall of 46.84%. In 2001-03, during another stock market scam, the Sensex fell from a high of 4437.99 on 15 February 2001 to a low of 2600 on 21 September, a decline of around 41%. On Wednesday, the rupee too benefitted from the rate cut by central banks. “The rate cuts by Fed and the European banks helped the rupee as its seems that now the dollar supply would start coming into the system," said Naveen Raghuvanshi, associate vice-president, Development Credit Bank. With global central banks lining up behind their tattered markets, some analysts and brokers in Mumbai say they too expect the Reserve Bank of India to cut interest rates when it meets on 24 October for a mid-term review. The Indian central bank had slashed the cash reserve ratio, or CRR, which defines the amount of money banks need to keep with it, by 50 basis points earlier this week. Earlier Wednesday, India’s finance minister P. Chidambaram said the government would inject more liquidity into the system, if needed, even as he cautioned investors against any “hasty" decisions. Prime Minister Manmohan Singh also called for a cabinet meeting at 8pm Wednesday specifically to discuss the impact of the global financial crisis on India. In a statement read out by Chidambaram, the cabinet reiterated its confidence in India’s finance system. PTI, AP, AFP, and Reuters contributed to this story.